Sony's first LCD photo frames ever have 800x480 displays (DVD res, which leads me to believe these were sourced from DVD players). The frames can scale photos down from up to 48MB, which would be good for transferring JPGs and even RAW files directly from a camera's memory card without a intervening PC session. The top line DPF-V900 and DPF-V700 also have Bluetooth compatibility with an optional adapter, and HDMI outputs. The frames do red eye correction using face detection and exposure adjustment. Given the quality of Sony LCD TVs, I'd say these would probably be as nice as those from Philips. $250, $190 and $140. Oh, did I mention I like those black frames? All business, maximum visual pop from the LCD. SAN DIEGO, Jan. 30, 2008 - Sony today unveiled its S-Frame brand of digital photo frames, offering vibrant LCD screens and stylish designs suitable for the living room, bedroom or office. The new DPF-V900, DPF-V700 and DPF-D70 digital photo frame models have WVGA resolution (800 x 480 pixels) along with 15:9 aspect-ratio screens to showcase your digital pictures with detail and clarity. Inside the black bezels of these thin frames is an advanced image processor that scales and displays images up to 48 megapixels, making the frames capable of handling photos taken with the most advanced digital cameras. "Digital photo frames are a natural addition to our line of digital imaging products," said Ted Okada, senior vice president of digital imaging for Sony Electronics. "Our new S-Frame brand of digital photo frames takes inspiration from the style and features of our Cyber-shot cameras and BRAVIA LCD televisions. They give consumers a beautiful and technically advanced way to showcase their memories." The three new frames offer convenient features such as 10 slide show variations, clock and calendar views, and two index modes so you can preview several photos at once. You can also conserve energy by using the auto power on/off setting to program when you want the frame to turn on in the morning and off at night. Functions of the digital photo frame can be managed remotely using the included controller. The 7-inch DPF-V700 and 9-inch DPF-V900 digital photo frames have 512MB of internal storage, while the 7—inch DPF-D70 model has 256MB of internal flash memory. In order to maximize internal memory, the models all offer an auto-resizing option that downsizes photos so you can store hundreds within the device and then return your memory card back to the camera. Digital images can be loaded onto the internal memory of the digital photo frames from several types of flash memory cards, including Memory Stick PRO™, Memory Stick PRO Duo™, SD Memory Card, MMC, Compact Flash, Microdrive® and xD-Picture Card. Photos can also be transferred to the frames via the USB cable from a personal computer or digital camera. 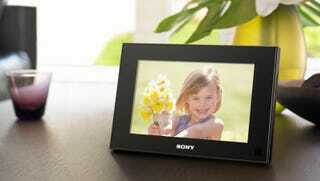 The DPF-V900 and DPF-V700 digital photo frames are Bluetooth®-enabled. Using a Bluetooth adaptor, sold separately, the frames can import images wirelessly from a Bluetooth-device such as a mobile phone. Both frames also connect to Sony® BRAVIA and other compatible HDTV sets to display your photos in high definition via an HDMI cable, sold separately. All three S-Frame models support JPEG and RAW (SRF, SR2, ARW) image file formats. The DPF-V900 and DPF-V700 frames also support TIFF and BMP file formats. These two models also feature Sony's Bionz™ processor with face detection technology for faster processing speeds, as well as in-frame photo correction like focus enhancement, red-eye corrections and exposure adjustment. The DPF-V900, DPF-V700 and DPF-D70 digital photo frames will be available for $250, $190 and $140, respectively. All three will ship in March and can be purchased online at HYPERLINK "http://www.sonystyle.com" http://www.sonystyle.com, at Sony Style® retail stores, at military base exchanges, and at authorized dealers nationwide.